It's a trend the president is quick to claim credit for, but the rate – nearly twice the national average – hides the reality of low-quality jobs and far fewer opportunities. PHILADELPHIA — It’s one of President Trump’s favorite talking points in promoting his administration’s success: the record low rate of black unemployment. But on a recent sunny afternoon in Vernon Park in Philadelphia’s Germantown neighborhood, that victory seemed hollow. As children laughed on the playground, several black men – some out of work, others homeless – sat or slept on benches nearby. Similar scenes play out across America and are backed by data that counter the positive picture Trump often paints in campaign-style rallies before largely white audiences. 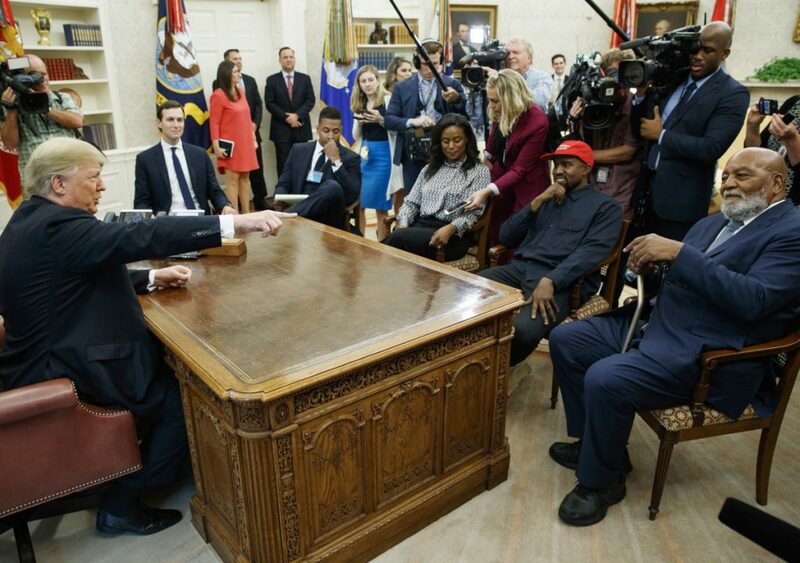 The retort was a reference to controversial rapper Kanye West, who had lunch with Trump at the White House on Thursday afternoon. Over roasted chicken, fingerling potatoes and sauteed asparagus, the two discussed crime in Chicago, more possible presidential pardons, job creation and the black unemployment rate. According to the Bureau of Labor Statistics, the unemployment rate for black Americans in September was 6 percent. That’s down from a high of 21.2 percent in January 1983, but is still nearly double the overall national unemployment rate of 3.7 percent. The unemployment rate belies the on-the-ground reality for many African-Americans, according to experts. While black employment may have improved, that hasn’t translated into broader economic gains. That’s partly because African-Americans are still disproportionately toiling in lower-quality jobs. Black people make up roughly one-fifth of those working in temporary jobs, a figure that hasn’t changed much in the past five years, even as the economy has improved. Just 12 percent of all Americans are black. And last year, Trump’s first in office, the income gap between whites and blacks widened slightly. The typical African-American household earned $40,258, down 0.2 percent from a year earlier, while white households saw an income gain of 2.6 percent, to $68,145. The racial wealth gap has also worsened even as unemployment rates have come down. The median net worth of a white household was 10 times that of a black household in 2016, the latest data available. That’s up from seven times in 2004. Perry noted that the national unemployment rate doesn’t take into account underperforming geographic regions or demographic groups. Philadelphia City Councilwoman Cindy Bass, whose district includes Germantown, remembers shopping with her family as a child along the neighborhood’s then-main economic corridor, where residents could buy food, get their hair done and find a pair of sneakers or a new outfit all within a few blocks during the 1970s and 1980s. The area is much different today, with less activity and fewer businesses and the jobs that came with them. Bass said Trump’s continued assertion that black America is recovering is an insult. In Germantown, a neighborhood that is 80 percent black, the median income is $28,046, less than half the national average, according to the census. The poverty rate is 34 percent, nearly three times the national rate of 12.7 percent. More than 20 percent of residents make less than $10,000, and 60 percent of families live on less than $50,000. That number obscures those who have dropped out of the labor market, who are doing cash-only jobs or who have gone underground. Carlton Washington sees many of them in his business and teen mentoring program. The 36-year-old lifelong Philadelphian learned construction from his mentor and tries to help those he can. In addition to his regular crew of about 10 workers, he has a list of about 50 unemployed or underemployed men who could help out at job sites. “If they’re not available, I just go throughout the neighborhood and try to find guys to put a little money in their pocket for the day,” Washington said, adding that a day’s work might earn $50 to $60 for tasks ranging from demolition to more skilled labor like electrical work, plumbing or carpentry. Washington said he would like to see Trump visit a neighborhood like his the next time he holds a rally in a state with a major city, to see what he sees on the ground, every day.